Bread & Butter Farm is so very very much excited to welcome this fabulous group of people and musicians to their first show at the farm! Coming down from Belfast, Maine, these four spectacular folks carry with them the fullest spirit of joyful music making, and are sure to fill the farm with a whole lotta light. See you there for somethin special! 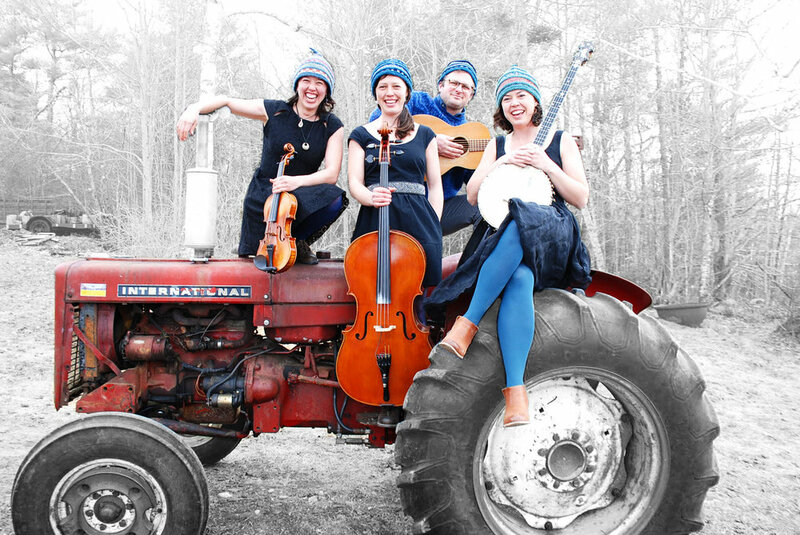 The Gawler Sisters are a fun-loving, folk-singing, fiddle-playing trio based in their native Maine. On banjo, fiddle and cello, Molly, Edith, and Elsie bring beautiful songs, tunes, and stories from their roots in the heart of Maine. They are accompanied by guitarist and worksong scholar, "brother" Bennett Konesni. Their music is cut directly from the fields and forests of their home state, having spent years absorbing the native style at the knees of their parents, legendary musicians John and Ellen Gawler. Though their style it is rooted in traditional "downeast" music, years of curiosity and travel into the world beyond have influenced their sense of musicianship. Their extensive collection of rollicking tunes in the Scots-Irish, Franco-American and Scandinavian traditions is complemented by angelic three-part-harmony, gutsy worksongs, and amusing odes to everyday life. With their infectious spirit and sparkling musicianship, the Gawler Sisters have earned a beloved place in the delighted hearts of varied audiences across the Northeast. The folk music itself brings a sense of community and grassroots connection that is welcoming and from the heart.